[178 Pages] The electronic warfare market is projected to grow from USD 23.13 Billion in 2016 to USD 30.32 Billion by 2022, at a CAGR of 4.61% from 2017 to 2022. The objective of this study is to analyze, define, describe, and forecast the electronic warfare market based on platform, product, capability, and region. 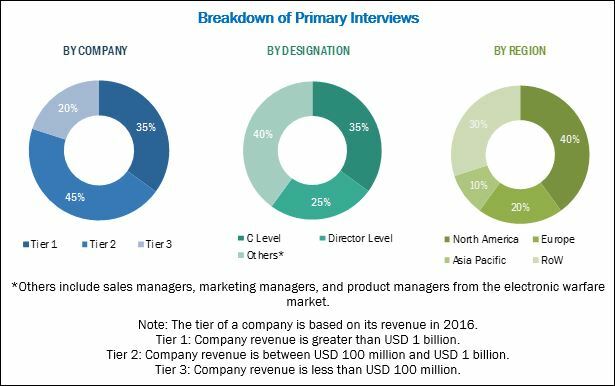 The report also focuses on the competitive landscape of this market and profiles companies, highlighting their financial positions, product portfolios, growth strategies, and analyzes their core competencies and market shares to anticipate the degree of competition prevailing in the market. This report also tracks and analyzes competitive developments, such as partnerships, mergers & acquisitions, new product developments, and Research & Development (R&D) activities in the electronic warfare market. The base year considered for this study is 2016 and the forecast period is from 2017 to 2022. The electronic warfare market has been segmented on the basis of platform, product, capability, and region. Lockheed Martin (US), Harris (US), Rockwell Collins (US), SAAB (Sweden), Boeing (US), Northrop Grumman (US), BAE Systems (UK), and Thales (France) are some of the manufacturers in this market. Contracts, new product launches, agreements, and acquisitions are the major strategies adopted by the key players in the electronic warfare market. The electronic warfare market is projected to grow from an estimated USD 24.20 Billion in 2017 to USD 30.32 Billion by 2022, at a CAGR of 4.61% from 2017 to 2022. Defense modernization programs and increasing procurement of advance electronic warfare systems are expected to fuel the electronic warfare market. The electronic warfare market has been segmented on the basis of capability, platform, product, and region. Based on platform, the electronic warfare market has been segmented into airborne, ground, naval, and space. The space segment is projected to lead the market during the forecast period owing to the increasing use of satellite-based electronic warfare equipment for military applications. Based on capability, the electronic warfare market has been segmented into electronic support, electronic attack, and electronic protection. The electronic support segment is projected to grow at the highest CAGR during the forecast period. This expected high growth rate can be attributed to the increasing adoption of modern warfare techniques in emerging nations in the Asia Pacific and Middle East regions. Based on product, the electronic warfare market has been segmented into electronic warfare equipment and electronic warfare operational support. The electronic warfare equipment segment is expected to grow at a higher CAGR owing to the increasing procurement of electronic warfare equipment in military ships and aircraft due to benefits such as advance electronic protection and electronic support applications. 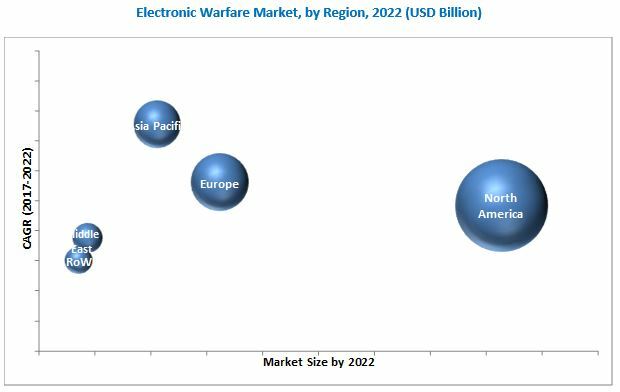 The electronic warfare market has been studied for North America, Europe, Asia Pacific, Middle East, and Rest of the World (RoW). The North America region is estimated to be the largest market for electronic warfare in 2017. Factors such as increasing insurgencies, territorial disputes, terrorism, unrest between neighboring nations, and political disputes in the region are also fueling the EW market growth in this region. High cost involved in the development of electronic warfare equipment can act as a challenge for the electronic warfare market. Major companies profiled in the report include Lockheed Martin (US), Harris (US), Rockwell Collins (US), SAAB (Sweden), Boeing (US), Northrop Grumman (US), BAE Systems (UK), and Thales (France), among others. New product launches and supply contracts were the key strategies adopted by leading players in the electronic warfare market from 2012 to 2017. These strategies have enabled companies to strengthen their positions.